New ILRI Board Member Wondirad Mandefro Gebru, State Minister in the Ministry of Agriculture in Ethiopia, giving the opening address at a workshop on ‘Gender and Market-Oriented Agriculture’ that was organized and hosted by ILRI in Addis Ababa, Ethiopia, 31 January to 2 February 2011 (photo credit: ILRI/Habtamu). The 35th meeting of the Board of Trustees of the International Livestock Research Institute (ILRI), being held at ILRI’s headquarters in Nairobi, Kenya, 10–13 April 2011, will mark a milestone for the institute, with selection and appointment of a new director general. The second five-year term of ILRI’s present director general, Uruguayan agricultural economist Carlos Seré, who took up his position in January 2002, expires at the end of 2011. Two candidates for his replacement will make presentations and interact with the ILRI board and staff during the week of the board meeting. The outcome of the selection process is expected to be announced at the end of the board meeting. Board members will also review an interim strategy for 2011–2012 that ILRI has developed. ILRI developed its current strategy, ‘Livestock: A Pathway out of Poverty’, covering the years 2003 through 2010, in 2002 through institute-wide discussions and consultations with key stakeholders. Since then, ILRI’s management team and board of trustees have reviewed the strategy every 2 to 3 years. Given an on-going reform process in the Consultative Group on International Agricultural Research (CGIAR), to which ILRI and 14 other centres belong, plus the formation of a new Consortium of CGIAR Centres and the development of a new Consortium Research Program, ILRI’s board and management determined that it would be best for ILRI to modify rather than reformulate its existing strategy to guide the institute during the upcoming 2-year transition period, from the beginning of 2011 through the end of 2012, by which time it is expected that ILRI will initiate development of a full new strategy, when the new Consortium of CGIAR Centres is more firmly established, to guide the institute from 2013 onward. The CGIAR Consortium recently approved a Strategy and Results Framework, which will guide funding in the future. And the CGIAR Consortium and Fund are working with the CGIAR Centres and partners to create some 15 CGIAR Research Programmes (CRPs). ILRI will be be involved in many of the 15 CRPs, and will play major roles in three of them: CRP3.7, focusing on increasing the productivity of livestock and fish farming, which ILRI leads; CRP4, on improving agriculture for better human nutrition and health; and CRP7, on climate change, agriculture and food security. This 25th meeting of ILRI’s board of trustees will welcome Wondirad Mandefro Gebru, State Minister in the Ministry of Agriculture in Ethiopia, to the board. Wondirad Mandefro’s scientific career has focused on increasing crop production through improved plant protection. His specific training and expertise is in applied genetics (MSc from Addis Abeba University) and nematology (MSc from the University of Ghent, in Belgium). He worked as a researcher for more than two decades at the Ambo Plant Protection Research Centre of the Ethiopian Institute of Agricultural Research. 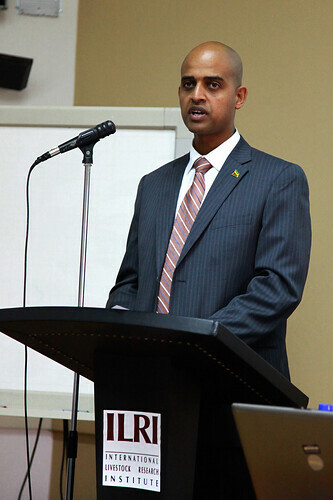 For three years, from 2007 to 2010, Wondirad served as director of the Agricultural Extension Directorate in Ethiopia’s Ministry of Agriculture and Rural Development. In October 2010, he was appointed State Minister in the Ministry of Agriculture. He also serves as the national focal point for the Comprehensive African Agricultural Development Program and as a member of the Board of the Ethiopian Seed Enterprise. This entry was posted in CRPs, Directorate, Ethiopia, ILRI, Kenya, PA and tagged Carlos Sere, CGIAR Consortium, ILRI BOT, ILRI Interim Strategy, Wondirad Mandefro by Susan MacMillan. Bookmark the permalink.